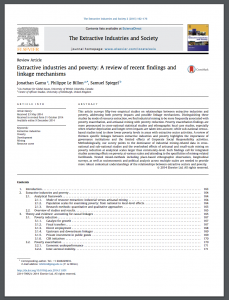 This paper surveys 52 empirical studies on relationships between extractive industries and poverty, addressing both poverty impacts and possible linkage mechanisms. Distinguishing these studies by type of resource extraction, the authors find industrial mining to be more frequently associated with poverty exacerbation and artisanal mining with poverty reduction. A review of 13 specific linkages between extractive industries and poverty highlights the importance of governance institutions and the limited effects of corporate social responsibility activities.